At approximately 10:30pm this evening [Apr.17] there was a firearm incident in the North Shore/Bandroom Lane Pembroke area, with one individual fatally shot. This comes how many days after the Yahoo article revealing Bermuda as the 2nd friendliest country in the world…. Very, very sad. 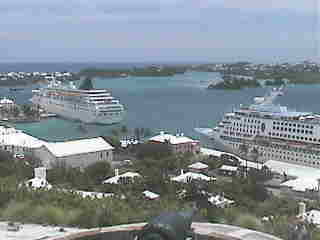 I hate to see Bermuda falling into the same abyss as the rest of the world with drugs and gangs and killings. Think of what happened in the US in the ’20s when Prohibition made alcohol illegal — without that spark, I doubt mobs and mob bosses would have been able to establish such a formidable stronghold. By the time Prohibition was repealed, it was too late. So legalize drugs, GLOBALLY. Let them be sold over the counter, taxed by governments to put money in our economic coffers. Take the money out of illegal hands and that should knock out a big financial underpinning from the crime syndicates. As for the drug takers or more specifically, addicts? I no longer weep for them: I’m more practical in my thinking. In my life I’ve seen far too many addicts of all kinds (be it drugs, alcohol or anything else for that matter) to believe that simple abstinence will work. At some point the addict will find his or her medium, and I firmly believe that they each must fall to their own personal bottom before recognizing it’s a hole they must climb out of to live. I’ll extend a hand, but the uphill battle is their own. As to the current crop of thugs? Bring back Devil’s Island. A remote place reachable only by boat and well defended offshore, where their only choice is to use their energies to kill each other or survive. Every day would be intense physical labor to find water, to find food, to shelter and care for themselves. If they want to have gangs there I couldn’t care less. Frankly, I can’t imagine a capo or gang boss would spend millions to rescue a few thugs — they’re too easily replaced. I’m sure there are a lot of people who know relatives, friends and neighbors who are involved with gangs but are afraid to come forward. It’s all well and good to for those of us who don’t to stand back and pontificate about how these folks should be brave enough to “do the right thing” but there’s too much fear. Thugs send messages — deadly messages — through family members. Who among us can willingly put an elderly grandmother, a 5-year old child in the path of a bullet or car grille? It will take a drastic change in the current climate for these people to feel safe enough for their families’ sakes to give the evidence that will help clear this societal blight from our lives. Update 1:09am: Police confirm they are investigating a second report of a firearm incident tonight. This is the second time in the past 30 days the island has experienced back-to-back shootings, following the shootings on Cedar Avenue and Rambling Lane which occurred 90 minutes apart on March 25th. Oh, Bermuda — where are you heading? If Bermudians don’t feel safe neither will visitors, and no stipend from the Bermuda DOT will bring them back, for tourism is a fickle lover. They’ll simply find another place to go.